Is Instagram aiming to become a Flickr for mobile sharing? 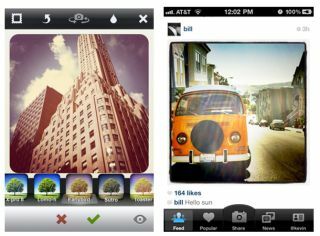 Users of the Hipstamatic iPhone photo-sharing application can now upload snaps directly to rival service Instagram as part of a new partnership between the companies. The agreement represents the first time Instagram, which has a whopping 27 million users, has allowed a third-party to access its API. The company hints at this being a first step towards creating an all-encompassing network for mobile photo-sharing, regardless of which camera app is used to snap the picture. Founder Kevin Systrom said: "It's a step in the direction that we're testing out. "We've been very careful about making sure that Instagram photos are about what's happening right now in your life, and we want to allow for more of those photos to end up on Instagram regardless of where they're taken." Systrom added, in an interview with Fast Company, that more and more people had been using Hipstamatic to tweak photos before uploading them to Instagram. The new pact simply makes that process easier. Hipstamatic, which is a £1.19 download from the App Store, boasts a comparatively low 4m users, but is seen as having a more versatile range of retro-style filters and lens effects. CEO Lucas Buick says the company has already witnessed a large sway from uploads to Facebook and Twitter and towards Instagram. "We've never been a social networking company," he said, "but we clearly benefit from social networks. So this will be the first app outside of Instagram that lets you into their network. That's pretty cool for us." Instagram still plans to launch an Android version of its phenomenally successful app later this year.